A recent, bestselling IDTechEx Research report ‘Electronic Skin Patches 2018–2028‘ found that the market for electronic skin patches will be worth $4.8bn in 2018. 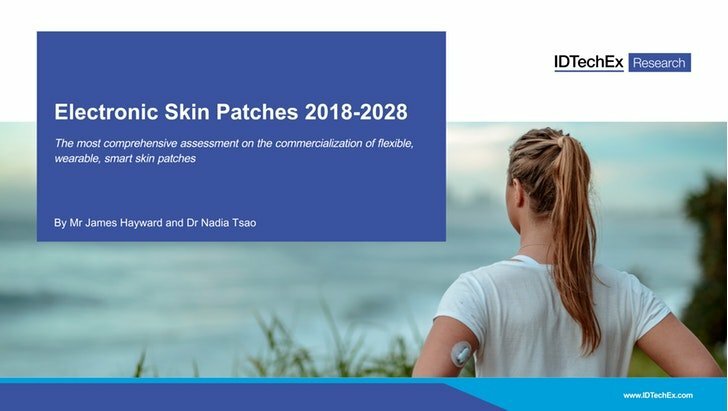 The report covers 26 different application areas, >85 companies and 95 different product case studies, with inclusion of historic market data by sector and subsequent market forecasts predicting that revenue from electronic skin patches will reach $10bn by 2023 and $15bn by 2028. This is the most comprehensive study on electronic skin patches, studying this emerging wearable technology product type that so many companies are investing heavily to develop and commercialise. Electronic skin patches could well be described as the ultimate wearable electronic devices. They deploy electronic components, including sensors and actuators with appropriate processing, energy storage and communication, directly onto the body, typically attached using an adhesive. Therefore, along with smart apparel and perhaps implantable devices, they serve as one of the most direct means to augment the user with technology. The IDTechEx Research report finds varying maturity across 26 application areas; sectors such as cardiovascular monitoring and diabetes management via CGM display relative maturity and multi-billion dollar markets today, but there is a long tail of many potential emerging applications which are the focus for many of the companies targeting future opportunities here. There is some inevitable degree of ‘technology push’ in electronic skin patches, and this is evident in many of the emerging sectors. Temperature sensors in skin patches have been developed for some time, and have managed to find applications in areas such as fever monitoring and fertility monitoring. Skin patch sensors have been used to detect the chemical composition of sweat for some time, and different application options from assessment of athlete hydration through to proposals for detection of potential higher value sensing (for example, detection of hormones such as cortisol, as demonstrated by Stanford and others). Motion sensing in skin patches has been used in areas such as in enabling detailed motion capture input for VR or animation, or through similar motion capture to assess recovery from an injury, efficacy of a certain drug in clinical trial or technique in sport. Electronic Skin Patches 2018–2028 provides all of the information required, including discussion of the different technologies, lists of all of the players involved, examples of every commercial or announced prototype device, assessment of different market dynamics by sector, and full numerical data, both in terms of historical data and market forecasts.